Metal/Soft material gaskets are combinations made of suitable metals connected with graphite, PTFE, rubber or even heat-resistant cords, wovens and braids. Advantage: Separation of the "bearing" and "Sealing" functions. Almost all profile joints can also be manufactured as an oval gasket or as a frame. Depending on operating conditions, CONVEX gaskets with layers, grooved profile gaskets with layers, spiral wound gaskets, corrugated gaskets, rubber-steel gaskets, WEKAS gaskets, jacketed or enveloped gaskets with inner eyelet are used - preferably in the main load, but some also in the off load. What makes Kempchen's patented gaskets stand out are the excellent seating properties with a low leakage rate, as required within the regulation of the Technical Instructions for Air. Profile RS-F 1 - Graphite stainless steel gasket with inner eyelet. Profile WZ 3 - Corrugated gasket with a sealing zone of PTFE, graphite or RivaTherm-Super. Profile W 11 A - Corrugated gasket with layers made of PTFE or graphite. Profile SpZ 2 J - Spiral-wound gasket with a sealing zone as well as inner and outer ring. Profile B 27 A - Grooved profile gasket with layers made of PTFE or graphite. Profile KHS/KNS - Double sealing system with leakage control, e.g. consisting of B29A in the main load and SpV1 in the off load. Profile B 45 A - CONVEX gasket with layers made of PTFE or graphite. Profile PWA 2 - PTFE-enveloped gasket for enamelled flange or glass fibre reinforced flanged joints. Gaskets made of the graphite-metal sandwich material RivaTherm-Super have already proven themselves a thousand times overwith almost all liquid and gaseous media for low to medium pressures and media temperatures up to 550°C. RivaTherm-Super is manufactured with plain foils or tanged grapple foil insert. In addition to RivaTherm-Super, the gaskets can also be made from other asbestos-free materials such as rubber, leather, cardboard, vulcanised fibre, felt, cork, cork-rubber compositions, ceramic-fibre or glass-fibre plates, elastomer-bound fibre plates, impregnated vegetable fibre materials, sponge and cellular rubber. For difficult sealing problems with large scale pipe forces and moments, high pressures, vacuum and/or high temperatures, for lowest leakage rate as well as for radially different expansion, the best possible solution from a technical viewpoint is the Kempchen metal gasket. These are in use as metal flat gaskets, ring-joint gaskets, lens gaskets, double-cone gaskets, convex grooved profile gaskets with layers made of aluminum or silver, convex shaped gaskets, and special profile gaskets with or without galvanic coating or as membrane welding gaskets and weld-ring gaskets. Low-alloy and high-alloy ferritic and austenitic steels. Non-ferrous metals and non-ferrous metal alloys based on nickel, copper, titanium, aluminum and silver. All patented Kempchen metal gaskets stand out for their great safety of application and extremely low leakage rates. They are, therefore, excellently suited within the meaning of the Regulation on Failure of Operation and Technical Instructions for Air. Profile AR 13 - Convex shaped octagonal ring-joint gasket with optimally designed surface radius. Profile B 27A - Convex grooved gasket with aluminum or silver layers (see Metal/Soft Material gaskets for other layers). 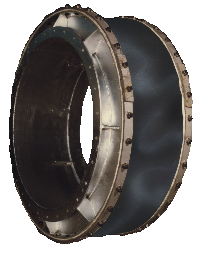 Profile H 7 - Convex shaped with self-sealing properties between smooth flanges. Profile T 4 - Baffle seals gasket for sealing of longitudinal baffle in high-efficiency heat exchangers.